So singleplayer practice mode places you in the "city" map, where you're surrounded by a lot of explosive barrels. Shooting the barrels will make them blow up. We think it's a good way for new players to get a hang of the in-game controls. It's also a way for more experienced players to kill some time when waiting for other players to come online! Shooting some highly explosive barrels in the practice mode! We would like to give practice mode a bit more depth in the future, by possibly introducing a timer. Practice mode would turn it into a mini-game where you have to destroy as many barrels as possible in as little as time as possible. We could add player times to some kind of leaderboard, which would be shown in the practice area as some kind of wall of fame! Let us know what you think of that idea. We have now added very simple 3D always-on voice chat. This means that you'll be able to hear your teammates and opponents! 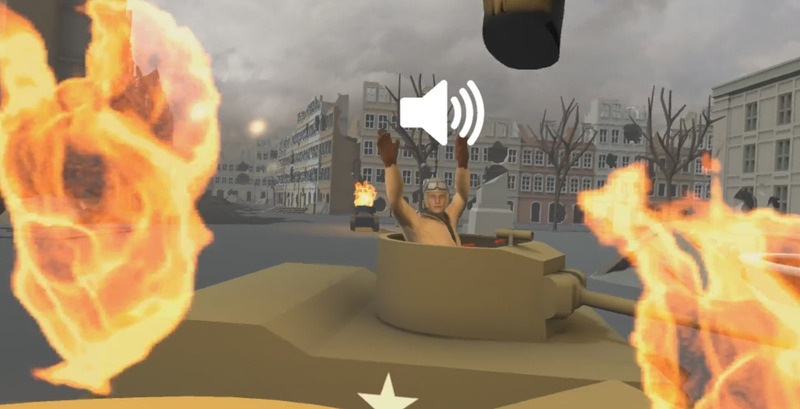 You'll be able to hear the panic in the voice of your enemy when you're slamming some shells in their tank. Or you can discuss a detailed tactical plan with your team. In its current state, your voice isn't transmitted over the radio yet, so you won't actually hear your teammates if they are far away from you. However, this will be added in the bigger content update! Windows Mixed Reality (WMR) support is on its way. We have now applied for a WMR development program and expect to be accepted. This would supply us with a WMR HMD, allowing us to work on implementing WMR to the game. Again, we expect that this will increase the player base as a small but significant part of the VR community has a WMR HMD. We would still like to add a variation of the current "city" map and improve the practice mode before we work on adding the new map, tank and Oculus support described in the previous devlog. We are doing this to increase the replayability of the game until the big content update arrives. Bah duh bop BAH duh.. " I'm lovin' it"